An exploration in the hobby world in Sweden as a neglected socio-cultural phenomenon in relation to notions of labour and rationality in the development of the Swedish welfare state from the 1930's to the present. At the beginning of the twentieth century, with the eight-hour working-day reform and the implementation of vacations for all employed persons, people were introduced to a new concept: leisure. Prior to this, clearly defined “spare time” was a luxury reserved for the wealthier classes. But while this new phenomenon has led to profound social changes, it has been remarkably little studied by academics. “Labour” has remained the key concept in the social sciences, as well as in politics since Locke, Adam Smith, Hegel and Marx. In this perspective the project The Wonderful World of Hobbies may be seen as an alternative history of the realization of the modern project in Sweden with the focus on leisure rather than on labour. The project takes its point of departure in the hobby as the antithesis to the alienation of labour in the form of an alternative micro-utopia of non-instrumental creativity and self-fulfillment, where the hobby also can serve as a safety-valve for a socially acceptable form of madness where it becomes acceptable, within the limits of a hobby, to collect bottle tops or to build model railways as an adult. The first part is an exploration of the philosophical, socio-political and aesthetic underpinnings of the hobby phenomenon, and is based on documentary materials from the beginning of the thirties to the present"
The Inverted Model Railway.1992. Ø 80 x 80 cm. Wood, electronics and various model railway materials. A model railway where the landscape circles around a stationary train, Stockholm. 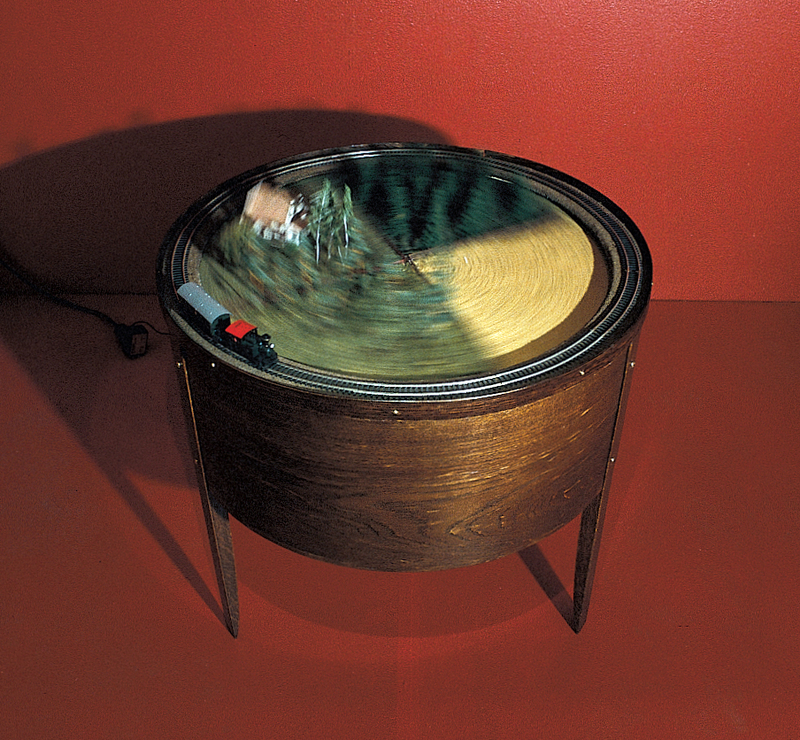 Installation at Proscpect 93, Schirn Kunsthalle Frankfurt, 1993. The Global Radio.1992. 240 x 240 x 240 cm. Wood, plastic, textile, metal, electronics. 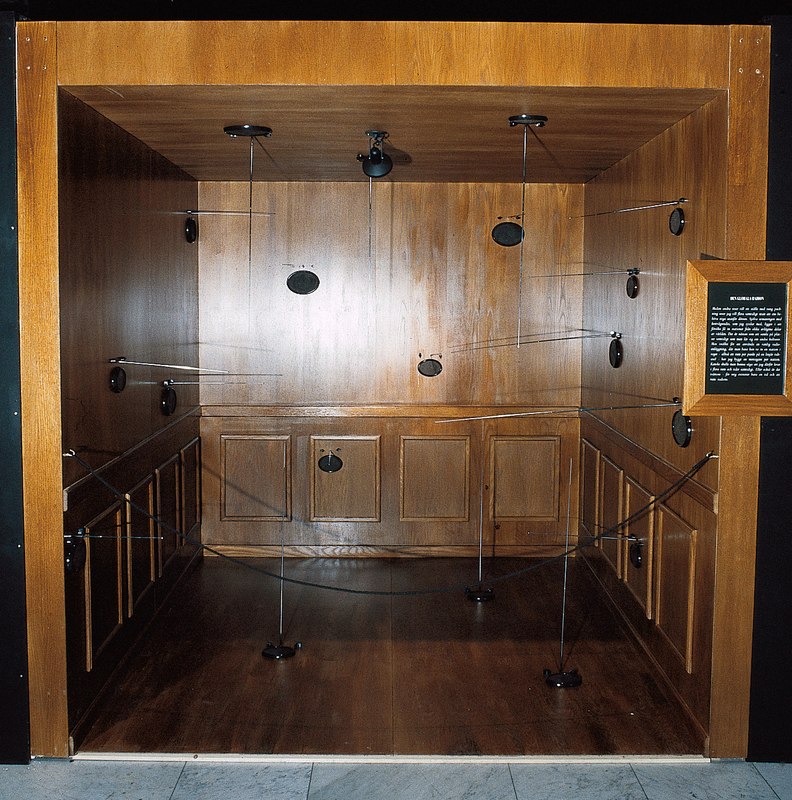 An installation consisting of a gigantic radio built like an oak panelled room, with radio receivers (speaker, knobs and antennas) standing out from the walls, floor and ceiling. Each receiver distributes sound from a specific radio station from somewhere in the world. Installation at Lunds Konsthall, Lund, 2001.